I could sit at a bar and just eat tapas and drink wine for every meal (preferably in Spain). Same goes for antipasto, and good Italian wine at a Trattoria in Italy. I would like to try one of everything please! There are some great tapas places to check out in NYC, Boqueria being one of my favorites, though all those little bites of tapas add up quickly, so make sure your wallet is sufficiently stuffed! The April issue of Food & Wine had a great article on Spain's best wine values and included this Valencian tapas dish by chef Raul Molina Fernandez. It reminded me of sunny summer days and was so simple to make. I served it with flatbreads and everyone loved it. It would go well with an antipasto platter too. Toast your pine nuts, either in a skillet w/ olive oil, or in a toaster oven. If toasting in the oven, watch them, they burn very easily. Cook your onion in a skillet w/ olive oil until softened, about 5 minutes. 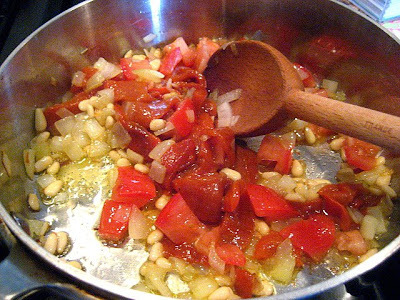 Then add your chopped tomato and chopped roasted pepper to the skillet and cook for about 3 more minutes. Take off the heat and bring to room temperature. 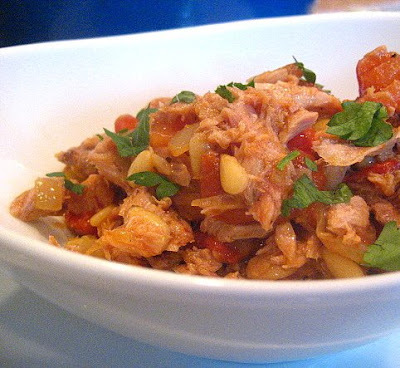 Add to a bowl with the tuna and toasted pine nuts. I added parsley for color and flavor. Check out the Ile de France Cheese blog today and see who won the "Chef's Special Prize" in their recipe contest with her Duck Confit Salad w/ Pears & Goat Cheese Toasts. YAY! Stacey - First of all congratulations on the award. But with your talent, it's not surprising. 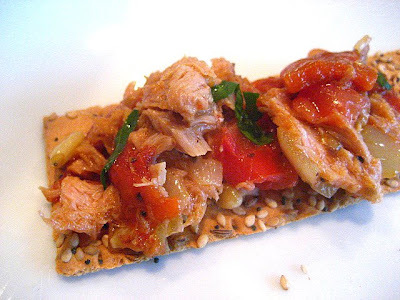 Second, I love that tapas with tuna. My kind of before dinner appy, but even would be great for lunch as a sandwich. Oh do I love eating tapas in Spain but from the looks of that I'd be happy to come over & eat it at your house too. Congrats on winning! Woo Hoo, Congrats Stacey!! I'm with Linda, I'm not at all surprised though. When I saw the Spain show with Mario and Gwenny, (I know you hated it)I was so envious of those Tapas bars!! 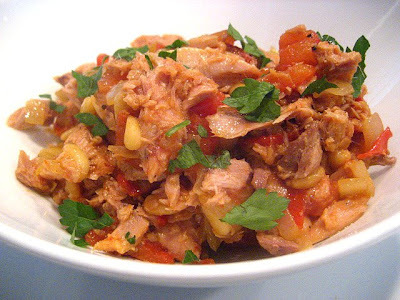 I love eating like this, your tuna is right up my alley! Mazel tov!! What IS the Chef's Special Prize?! The tuna sounds great. And, congratulations! That's very cool! it looks really tempting! i am hungry currently!!! !